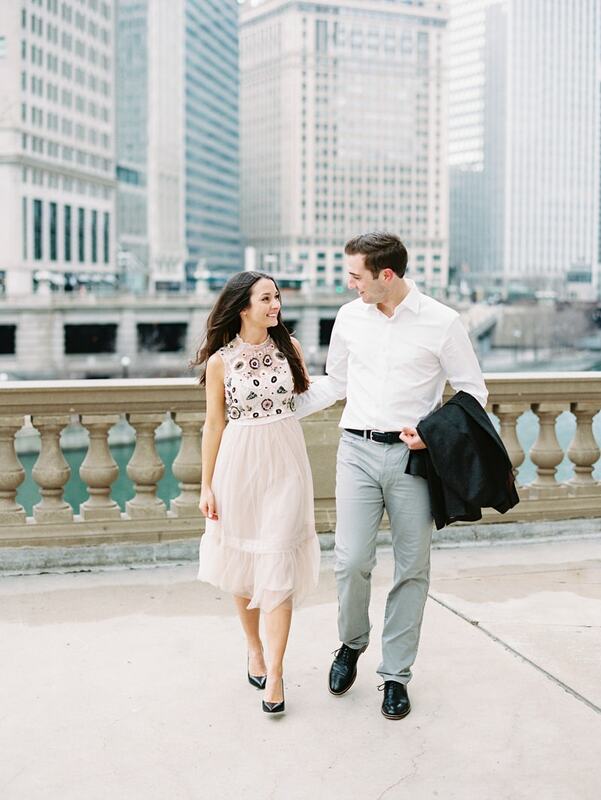 Windy City Engagement. 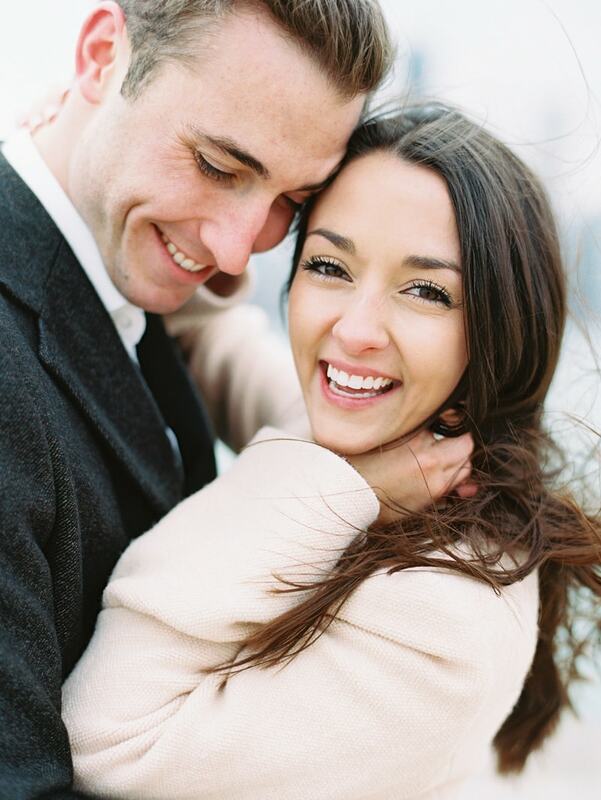 They may have chosen the“Windy City” for their engagement session but Chicago cuties, Molly and John, didn’t let the cold temperatures get them down. 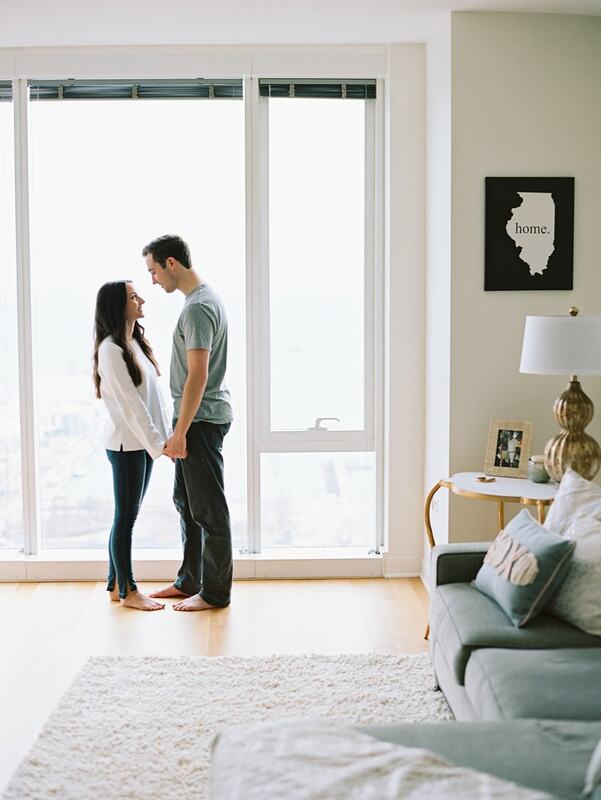 Their seamless transition from outside on the Chicago streets to inside their cozy apartment only makes their session that much more endearing and personal. The first part of their session takes place by the Chicago River. Molly wears a gorgeous blush coat over an equally attractive blush dress and completes her look with black heels. 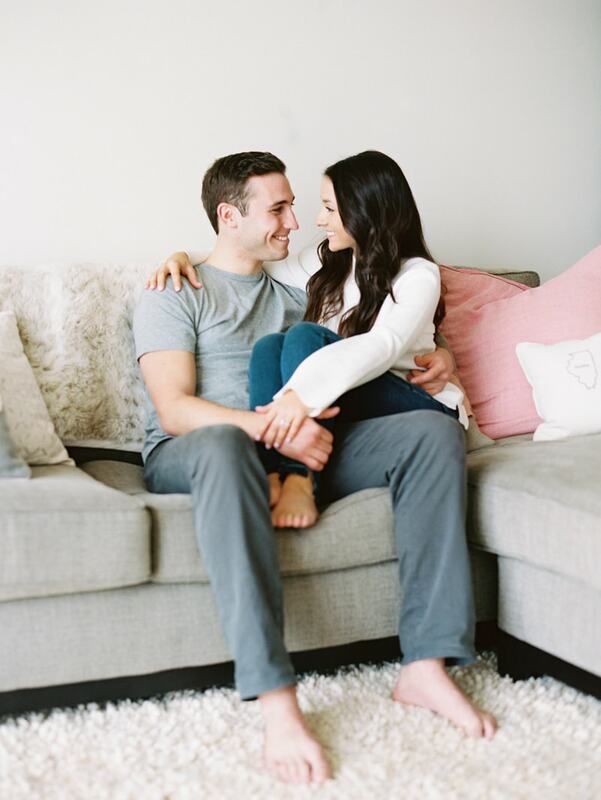 John is the perfect complement to his fiancée in a black coat over a white shirt and gray pants. The photographer gets a classic up-close shot of not only her beautiful engagement ring but their beaming smiles. A few more photos show the couple holding hands, sharing a kiss, and taking in the Chicago city skyline. They even pause for a photo in front of a beautiful white building with brilliant gold doors. Molly and John manage to take off their coats and show their complete outfits before retreating inside for warmth and comfort. Molly changes into a pullover sweater and jeans, while John dresses down in a gray t-shirt and jeans. Inside their cozy apartment, they literally just do what they do best – relax. They’re seen snuggling on the couch, exchanging a hug, and even sharing a comfy bean bag in front of their large apartment windows. This is as personal as it gets. You get two sides of Molly and John in their engagement shoot: what the world sees and what they see. The contrast between formal and relaxed is special and genuine. Because at the end of the day, your fiancé is the person you just want to come home to – no matter what.